Do you remember how the world opened up to you when you began to read? Books seem magical. They can transport you to different lands and different times all while you are sitting in your comfortable reading nook. The books I ma sharing today do this. They take you to different times and places and three of them are historical books. 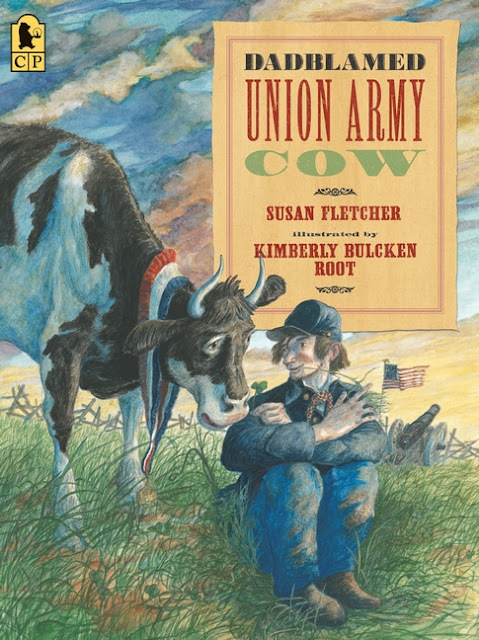 Our first book is Dadblamed Union Army Cow by Susan Fletcher and illustrated by Kimberly Bulcken Root. 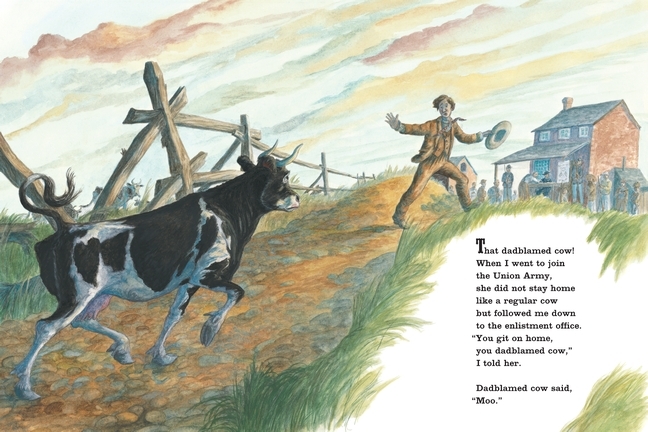 This is based on the true story of cow that followed her owner into the Civil War. She traveled with the Fifty-Nine Regiment of Indiana Volunteers from 1862 to 1865 and gave the soldiers milk that may have saved their lives as the supply train could not keep up with them. In the story the owner keeps telling the cow to go home and complains until the soldiers realize that during the cold winter nights cuddling around the cow for warmth was useful and having fresh milk was helpful. This is a fun story that gives a bit about the Civil War and history without going into too many details. You can see the newspaper article about the cow in the far right corner of page one here. The photos in this book are fun and help with the story of the war and the cow. There is a gloss and finish to them that make me feel the time past. The story itself is really fun and I love seeing the true story as well. We really enjoyed this book!! 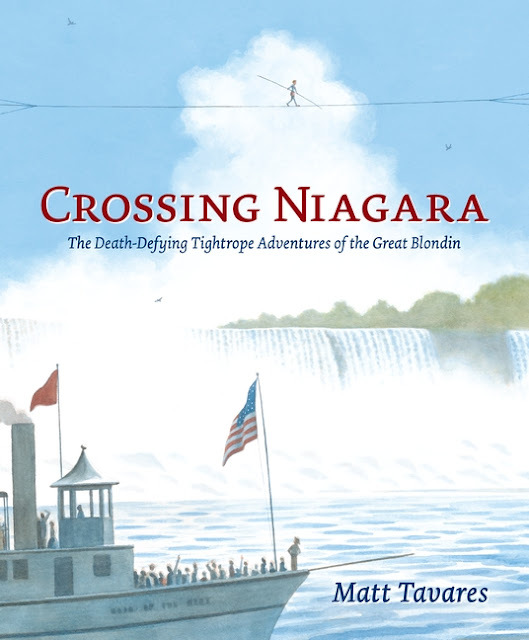 Our next book is Crossing Niagara: The Death-Defying Tightrope Adventures of the Great Blondin by Matt Tavares. This book takes us the Niagara Falls in 1859 when the Great Charles Blondin (born Jean Francois Gravelet) first crossed the Niagara Falls on a tightrope. He did this feat over a dozen times during 1859 and 1860. He added more challenges during the various crossings. He tried it blindfolded. Then he carried his manager Harry Colcord on his back. At the end of the summer of 1860 the Great Blondin no longer was making front page news for his crossings so he moved on and never returned to Niagara Falls. The quality of this book is amazing and the pictures help demonstrate the challenges of his feats. In fact there are two pages that fold out to show the long way across on. This book brings the Great Blondin's story to another generation and allows a glimpse at a different time and an amazing performer. It is another amazing book to check out. For more on Charles Blondin see here. 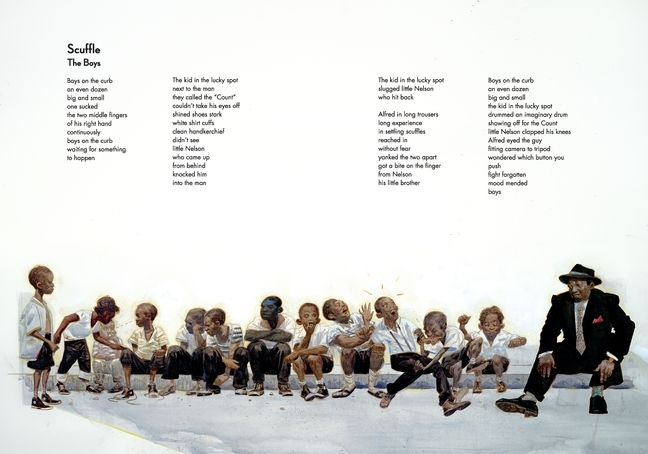 Our next book takes us to Harlem in 1958. 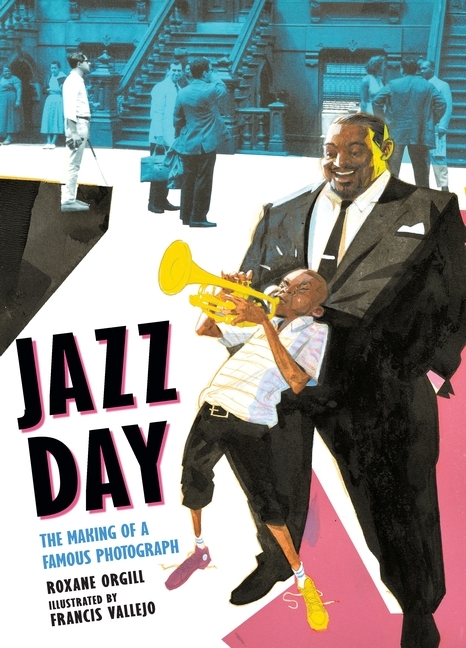 Jazz Day: The Making of a Famous Photograph by Roxane Orgill and illustrated by Francis Vallejo is full of poems about the taking of the photograph of jazz musicians on 126th Street in Harlem by Art Kane. This photograph was published in Esquire Magazine but also went on to be seen in films as well as have documentaries about it. The book is full of poems about the people in the photograph and the people watching from the street or their homes and so much more. At the end of the book there is a bit about each of the famous people which the poems are written about and not all fifty-seven musicians. The book also includes the famous photograph so the reader will understand how it was a big deal to get this gathering. You can see the photograph here. It is titled Harlem 1958 or A Great Day in Harlem. This book is for slightly older kids or kids with a jazz background. Hazel had a hard time following the different poems and understand what was going on. I finally finished it by myself because she got too frustrated with it. It is informative and also helps teach a bit about poetry. 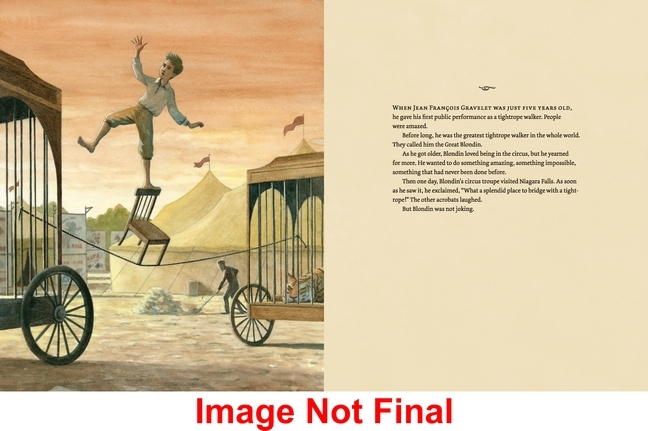 The illustrations take you to the scenes and allow you to see what was happening. Can you imagine getting fifty-seven jazz musicians together in front of a brownstone at ten in the morning? The musicians were all busy socializing with old friends they do not see all the time and a group of neighborhood boys were hanging out and managed to be in the photograph. Art Kane must have had his hands full with this crowd. Come experience the day with poetry, illustrations and the photograph. Our final book takes us down to the Louisiana bayou where the stories are a bit peculiar with things like 500 pound fishes more or less. 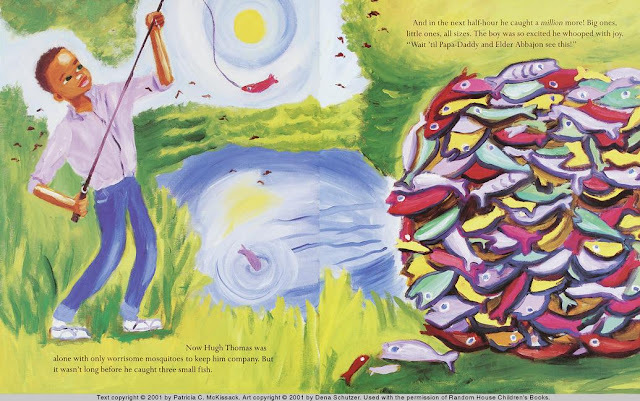 Thomas is out fishing and is told the story of Papa-Daddy and Elder Abbajon catching the large fish back in 1903. Thomas does not know if it was a bit of exaggeration until he is fishing alone and catches three fish and a million more. Of course by the time he gets to Papa-Daddy and Elder Abbajon to tell his tale he has just enough fish for breakfast for the three of them. He met pirate raccoons, thieving crows, the grand-pere of all the alligators and a crafty cat. Each animal took their share (and more) of the fish. This tale provides so many lessons. First of course is life on the bayou. Next of course is the exaggerations. Which tales are believable? What do these tall tales mean? Then there is the number sense. A million is a large number. Throughout Thomas's tale he gives up half the fish he has. This gives a great opportunity to look at halving as well as what the numbers mean. The big question is how many fish did the crafty cat eat to leave Thomas three fish? Now you know I always love bringing math to our stories so needless to say I love this one! 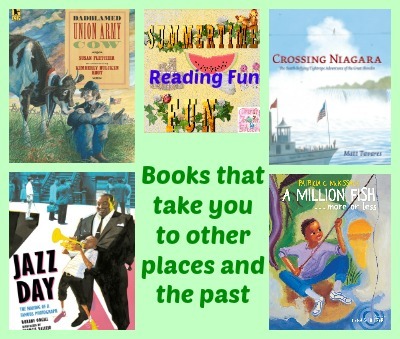 So if you are looking for some books to show your kids how to travel with stories (and even travel through time), I hope you will check out these great books.